Welcome back, Arrowheads! With Ollie taking a long deserved break from being the Green Arrow to be a mayor and a father, it’s now to John Diggle to take the mantle and lead of Team Arrow! Of course, he has his own share of problems (nerve damage and taking some illegal drugs to relieve that pain), but Diggle is finally starting to settle into his new role. Of course there is the still at large Black Siren, and her mystery benefactor. Hey, where is she, by the way? Black Widow. The Team gets news of Black Siren popping up when some accountant is found dead, after she did a sonic scream into his ear (ewww). This random killing does have the inconvenience of interrupting a dinner date with Ollie and Felicity, calling the latter away and offering to see him at her place later. Meanwhile, Black Siren is thanked for retrieving an “item” and getting told of another target she has to hit by some mystery man (more on that later). At the HQ, Curtis reminds Felicity about some documents they need sent out for their little start-up operation, so she heads home. At home, she arrives and finds Alena, the hacker from HELIX last season, waiting inside. She is scared about something involving Cayden James, the hacker Felicity helped HELIX break out of ARGUS custody last season. The bruise on Alena’s face should be concern enough, but she’s there to see Felicity because she thinks James is about to commit some truly horrifying terrorist act. One that has a casualty rate of 4 percent…of the world’s population! 300 million people dead does not sound cool at all! Note to all guys: be careful of who you decide to meet in a bar, because they might be a metahuman from an alternate dimension who can sonic scream melt your brain by screaming in your ear. An Ear Full. Back at the HQ, the Team discovers that second victim Black Siren was sent to kill is now dead, and she’s just as random as the last guy. Leaving Curtis to handle tech while Felicity is away, Felicity is helping Alena find out what James is up to, and that requires some hardware she doesn’t have at HELIX’s old stomping grounds in town. Before the two can leave, Ollie shows up expecting to finish that date only to see Alena and hear about James’ plan. He offers to help, but she said she’ll be fine without him, and yes, she’ll eventually tell the team about this (she won’t). Curtis is still at the HQ, and finding a little tracker to locate when Black Siren uses her powers. It just happens to go off as he brings it online, and the Team scrambles to the source of it: a parking lot. There, the Team finds a third victim dead, and fight Black Siren before she escapes. While this is going on, Felicity and Alena are going to an underground club to see a black market guy called “Amnesiac” about picking up some hardware. That meeting with “Amnesiac” seems like it’s about to go bad, when a masked Ollie knocks out all the bad guys. Felicity is stunned, not because of the help, but because she is worried about Ollie as the FBI is still investigating him. So, she gets what she needs, and Ollie I’m sure is a little embarrassed. Two Threads, One Place. The Team is back at the HQ, and finally figure out that these random people can’t be random. These have to be cover identities, but covers for what? Well, meanwhile Curtis has figured out a way to maybe locate Black Siren with her soundwaves. Diggle decides to call Felicity, who is with Alena at HELIX’s old headquarters, and she says she’ll be able to help soon as she fixes this mess with James. Funny thing about that: Curtis gets that new detector running, and finds her and someone Diggle recognizes…at the old HELIX headquarters right now! Both Felicity and Alena are surprised by Black Siren and her contact…and their boss, Cayden James! He is rather calm and disappointed in Alena for betraying him, and let’s Felicity know that despite his respect for her, she’s gonna have to die too. The Team arrives in the nick of time to fight Black Siren, James and his goons away, but not before Alena takes a bullet in the gut. The Monster Let Out. At the HQ, Felicity has learned Alena is touch and go at the hospital, and not taking her release of James very well. Diggle orders her to go home for now, and just a little bit later, Ollie comes to visit. He reassures her that this mess isn’t her fault, and lets her know why he came to help her at that club earlier: because he wanted to make good for all the times she backed him up, being his support all these years. Isn’t that sweet? Well, she gets called away because of what we learn James is up to. He’s planning to crash the whole Internet, which is connected to so many important systems around the world, could likely cause about 300 million people or way more to suddenly die. Apparently the Internet is connected to a giant server farm (sure, okay), and in order to get in, they need three sets of handprints…like say, the handprints of three random people who have cover stories, but work at said server farm! Guess who happens to be there right then with said fingerprint masks? Vault Hunting. The Team and Felicity arrive at the server farm, and find the security dead and the vault door open. They also find James’ men and Black Siren there too, and Felicity is sent off to shut down a virus James has installed to burn out the whole system. She has some unexpected help from her own special Overwatch: Ollie is in the HQ helping her out! She gets to the main control room and finds James already gone, and with a little positive reinforcement from Ollie, stops the meltdown. Black Siren gets away again, but hey, the Internet still works! Speaking of, the next day at an airstrip, James presents Black Siren with a device to block Curtis’ little Black Siren tracker. She’s confused why she’s being paid for a job half done, but James assures her the job wasn’t to destroy the Internet, but to get the firewall for the vault shut down so he could install a critical piece of code for his little pet “Arclight” project. Better to have Felicity unknowingly get her hands dirty doing the job than him. Crafty bugger. A mysterious computer hacker, a random military guy, and a sociopathic lady? Are we sure ARROW hasn’t been a secret prequel to PERSON OF INTEREST all this time? One More Step. Back to the night before, Felicity visits Alena in the hospital to see how she is doing. While there, Alena gives Felicity an idea about what she could develop for her start-up. It’s something Felicity has been sitting on literally: mass producing the spinal implant chip Felicity has in her, which is what she tried and failed to get produced at Palmer Tech. Oh, and why not take the name Helix for her new company and put it to some good while she’s at it? Felicity and Ollie end up back at her loft to have that “dessert” they’ve been putting off (and no, I don’t mean ice cream or something). But they get interrupted by a call for Ollie. 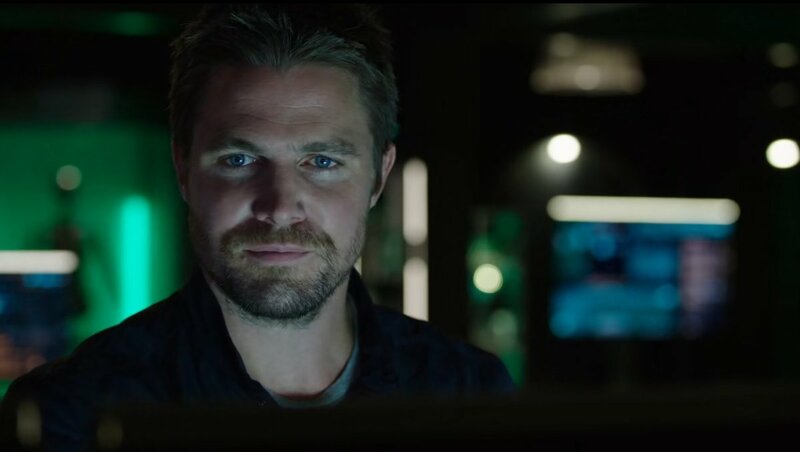 It’s his old buddy/frenemy Slade Wilson, and he needs Ollie’s help. So that’s something to look forward to next time! 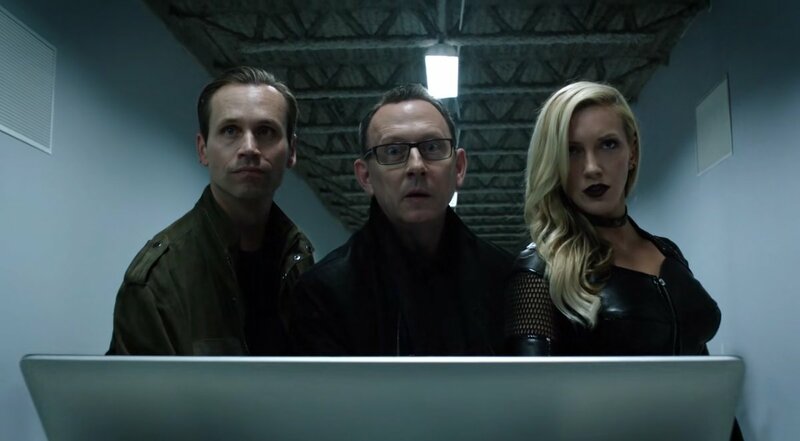 –Comic book connections: I did want to note Michael Emerson (or Ben Linus from Lost) as Cayden James. That was a nice reveal to that mysterious casting news. Also, he was the voice of the Joker in DC’s animated adaptation of The Dark Knight Returns. –So that anti-vigilante bill is only 30% popular. The Team seems perplexed by that, but c’mon, that’s pretty decent polling. –Now we know Cayden James is the one who rescued evil Laurel from Lian Yu, but why and for what? This Arclight thing? –Ollie hasn’t completely got past not running the team yet, which might be a good thing depending on what happens with Diggle’s hidden drug use.